GALION — Art students at Galion High School have joined the Memory Project, a charitable nonprofit organization that invites art teachers and their students to create and donate portraits to youth around the world who have faced substantial challenges, such as neglect, abuse, loss of parents, violence, and extreme poverty. Given that youth in such situations usually have few personal keepsakes, the purpose of the portraits is to provide them with meaningful mementos of their youth. The project also allows art students to practice kindness and global awareness while enhancing their portraiture skills. Galion students are participating as part of a course titled Drawing II. It emphasizes the importance of kindness and gratitude via positive psychology. To do this, the students receive photos of children who are waiting for portraits, and then work to create the portraits. Once finished, Memory Project delivers the portraits to the children. In total, the students will make portraits for 12 children in Haiti prior to the end of the first semester. Next semester’s Drawing II class also will work on the project. Courtesy photo Galion High School art students Austen Strickler and Colten Cox work on a special project for vulnerable children as part of The Memory Project. 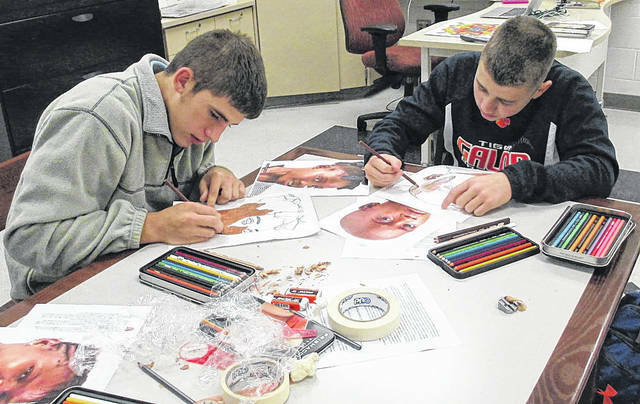 https://www.galioninquirer.com/wp-content/uploads/sites/38/2017/11/web1_ghs-art-1-.jpgCourtesy photo Galion High School art students Austen Strickler and Colten Cox work on a special project for vulnerable children as part of The Memory Project.